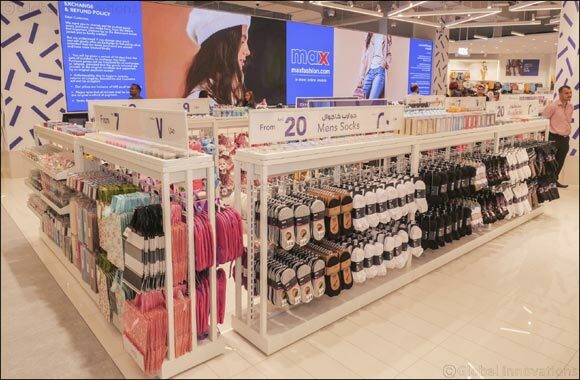 Dubai, UAE, November 24, 2018: Max Fashion has unveiled a fresh new look and feel with the opening of its revamped flagship store in Ibn Battuta Mall. The modernized space of: 27,373 square feet was developed with the best customer experience in mind, encouraging the discovery of Max’s new collections and brand positioning. The new concept aims to improve customer engagement and productivity with a white and luminous design. Looking to provide a unique and personal shopping experience, the layout includes accommodating features like customer feedback solution from Pisano where customers can ask for assistance, provide feedback or rate services. Staff are also equipped with mobile POS to enable a quicker and more accessible experience. There are additional amenities throughout such as phone charging docks as well as digital screens, Click & Collect counter and iPad stations where shoppers can check out themselves. “A key function of our retail spaces is to simplify the shopping experience and to make it more intuitive and enjoyable for customers. The revamped store in Ibn Battuta represents a step further in our desire to create a unique space where fashion, and technology co-exist. Customers old and new will discover Max’s evolving brand experience and collections, in a space designed to deliver a seamless experience across all our platforms,” said Kabir Lumba, CEO of MAX Fashion MENA. The store features interactive technologies developed by Ombori Group – including an interactive digital window screen - which can be controlled using your mobile device as a remote, welcomes customers and provides fashion inspiration. Customers can scan and browse products on maxfashion.com on the screen and their phones. A voice-controlled mirror that responds to Arabic and English offers user-specific fashion recommendations and takes selfies which customers can upload to MAX Fashion MENA Facebook page to claim great offers. “The entire store experience is built around how the Millennial and Gen Z demographic shop, from digital screens displaying inspiring looks as they view them within the social media world to iPad stations” added Lumba. Max Fashion’s Ibn Battuta store is a stylish and modern premise, featuring a new space and design concept, which aims to unify all the collections in a large, single dynamic space, significantly improving the overall customer experience. The brand’s new winter collections are also available at the store - delivering an assortment defined by trend-worthiness, uniqueness, and value. In addition, the store has an interactive play area for children, spacious fitting rooms and seating areas along with a make-up station for beauty buffs. Don’t miss a chance to experience innovative shopping at MAX Fashion store in Ibn Battuta Mall, Tunisia court or become one of Max’s 50,000 Shukran customers to gain loyalty points and avail discounts.